Starbuck was born April 1st 2001 and passed on Wednesday December 3rd 2008 after a brave and courageous fight with a horrible cancer called hemangiosarcoma, presenting in his liver. The oncologist gave him a few days to live but he fought for 3 months to the day of his diagnosis. We call him our miracle dog, no only for fighting the cancer for as long as he did but also because he touched the hearts of everyone he met throughout his lifetime. This is one of our favorite photos of Starbuck. 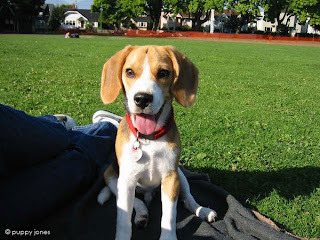 He was just a puppy and you can see how happy and healthy he was in this picture.This is the park he grew up in. He was a good beagle and never ran off like they say beagles do. He always wanted to stay near us and be with us (and he still is). We love you Starbuck, forever in our hearts, we carry your heart (we carry it in our hearts). http://www.puppyjones.com/behind_scenes_main/behind_scenes_main.php and click on the "Fighting Cancer" category link. Thanks for letting us nominate Starbuck! That is a pawsome photo, what a handsome guy! Thanks for sharing with us! Great photo of a very handsome doggie. What a lovely way to remember him. Oh love to you and Starbuck. My brofur Eddie died in 2008 after being diagnosed w/hemangiosarcoma. Starbuck was truly a miracle for living three months. Special love to you. Starbuck looks so full of life and energy, that is a furbulous photo. Thank you so much for sharing that experience with us all, we really appreciate it. Thank you everyone for the nice comments. We appreciate it!